This instructional course is for people who want to spend time focusing on their navigation skills. It can be useful for total beginners as well as hill walkers who already have some navigating experience but want to consolidate their skills. The days out will take you away from the paths and cairns and onto the open mountainside where you can escape the crowds and use your navigational skills for real. 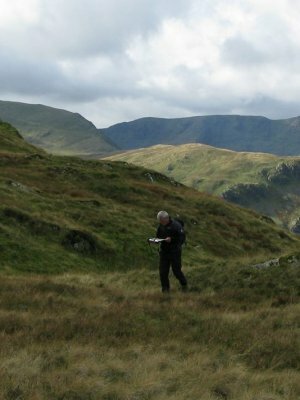 We tend to run the majority of our navigation courses in the Lake District, the area offers brilliant terrain for this type of course whatever the weather. We can also run navigation courses in other locations on request, please Contact Us to discuss. night navigation. Micro navigation by head torch. This can be an additional 2-3 hours out on the mountain at a small extra cost (£20 per person) and is best run outside the Summer months when its darker earlier. Note – by including extra skills, other than night navigation, you will reduce the time spent on navigation and so 2 days at least might be worth considering. Or alternatively you could consider our Hill Skills course which is a more generic hill walking skills course. Note – We run Summer Navigation courses at a 1:6 instructor client ratio max. We can supply additional instructors for larger groups wanting Summer Navigation or you can look at Group Programmes for group activities which can include guided summer walks for groups.